While planning a microgrant project when I was a Council on Library and Information Resources (CLIR) fellow from 2014-16, my colleagues and I were interested combining TEI, special collections, and graduate student pedagogy. 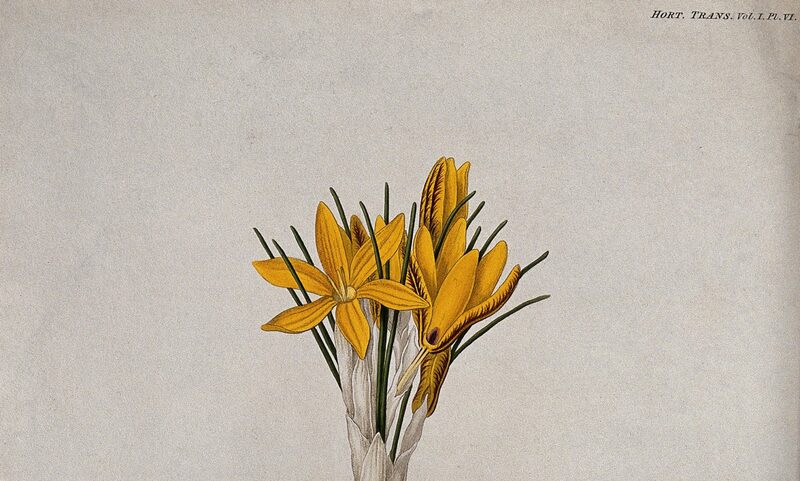 I had recently learned about the Early Modern Recipes Online Collective (EMROC) and their efforts to transcribe culinary and medicinal recipes in libraries around the world. Knowing that MLIS students do not always receive hands-on experience with rare books and manuscripts, I chose a transcription project for library students. The task? 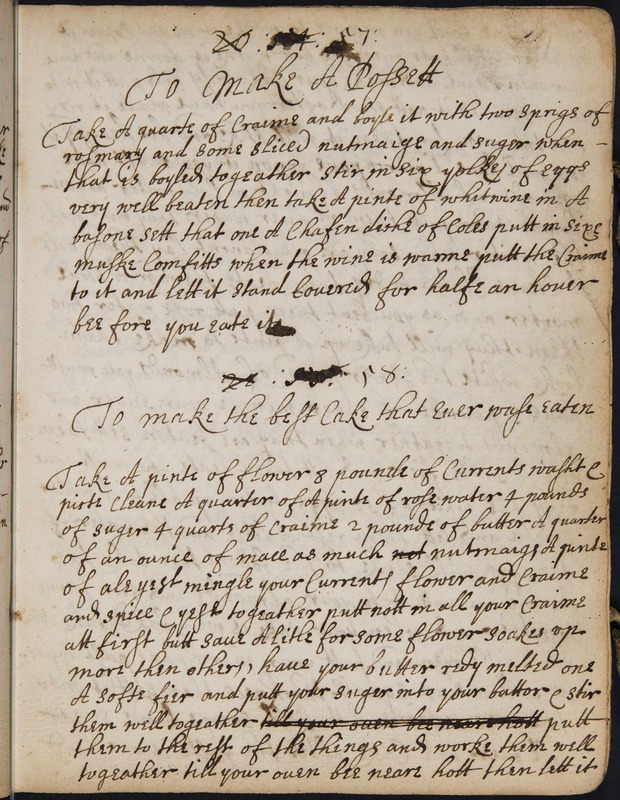 Complete a TEI-encoded transcription of an entire early modern recipe manuscript and make it available to a wider audience online. I recruited a UCLA MLIS student, Christine Curley, to work on the project. While she had no previous experience with recipe manuscripts or paleography, she proved to be apt for the work, picking up paleographical nuance quickly and doing a remarkable job of capturing the vagaries of early modern orthography. She also took a course on TEI so she could encode her transcription with confidence. Since opportunities to gain such skills in graduate school are typically reserved for Ph.D. students in humanities fields, I thought it was important to expose an MLIS student to the kinds of methods (paleography, textual editing, digital humanities) that scholars use to interpret texts and make them accessible to other researchers, especially since librarians are increasingly collaborating with faculty and students on projects. 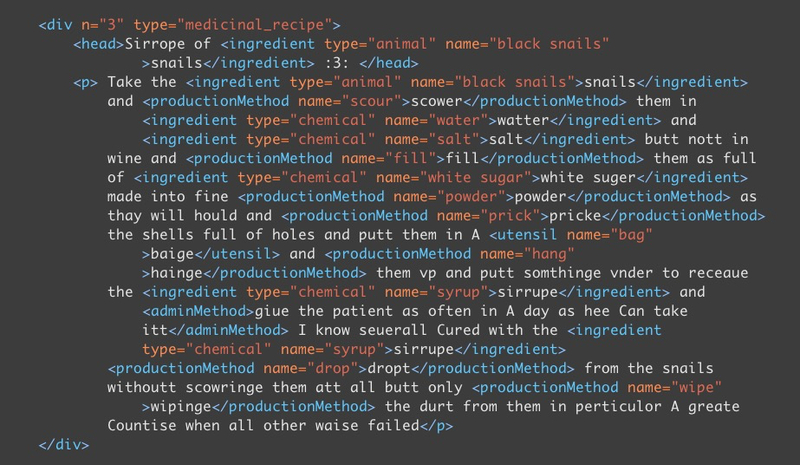 Before Christine encoded the manuscript, I created a slightly customized version of the typical TEI schema using the web tool Roma; the schema incorporated tags the EMROC group was already using in their transcriptions (<ingredient>, <ailment>, <administrationMethod>, and <productionMethod>). We also added <utensil> and color-coded each tag in our basic HTML output of the TEI edition. All of these custom tags can be easily transformed into normal TEI using a simple XSLT script. This manuscript was also part of the Clark’s CLIR Digitizing Hidden Collections project to digitize over 300 early modern bound manuscripts. Mariabella Charles’s manuscript is now freely available on Calisphere, in addition to 166 other MSS. We plan to add Christine’s transcription of the manuscript into page-level metadata on Calisphere in the next couple of months. One interesting aspect of the Charles manuscript lies in its description of the various female knowledge networks through which recipes passed. There are recipe texts attributed to a “Mrs hanway,” “mrs dabe,” “mrs Jean,” “Mrs Harding,” and others. Several physical addresses added to the manuscript’s endleaves provide even more information on female knowledge networks: examples include “Att Mrs Paige in warwick street ouer Against Sr Henry goodrick golden square.” When transcribing and encoding these addresses both Christine and I wondered if this type of evidence might be marshaled in early modern recipe projects. If such addresses are fairly common in recipe manuscripts, could we catalog and map them onto a cartographical representation of London? Would such a visualization of recipe manuscript data reveal anything about early modern foodways and the geography of ingredient collection/preparation? With more and more recipe manuscripts being transcribed today, such questions and methodologies are becoming increasingly feasible for early modernists to answer and implement. It was so nice to be able to get to know the authors of the manuscript by deciphering the handwriting of their recipes. The recipes show a high degree of self-sufficiency; most of the ingredients could be hunted and gathered from nature … Something I also noticed from a more technical standpoint was that that the neater, more careful handwriting was actually more difficult to discern, and the handwriting that was more like quick script was actually much closer to modern messy handwriting … This gives me hope that maybe in the far future, if my letters and journals survive the centuries, perhaps my descendants may actually be able to decipher my own sloppy handwriting and make sense of it. As Christine also notes, “there are many culinary recipes which actually seem quite delicious, such as mutton with lemon, butter, capers, nutmeg, and white wine. There is a recipe for ‘the best cake that ever was eaten,’ which really does sound very good.” Librarians at the Clark are hoping to collaborate with Christine on a future public event involving early modern culinary culture—hopefully with samples of this “best cake” on offer. Philip S. Palmer, Ph.D. is Head of Research Services at the William Andrews Clark Memorial Library (UCLA). His work centers on digital approaches to early modern material texts, Renaissance travel writing, and Thomas Coryate. His publications include articles in Renaissance Studies, Huntington Library Quarterly, and The Library, as well as an edition of the booklist of Sir Thomas Roe for Private Libraries in Renaissance England. He is currently Principal Investigator on grants from CLIR and NEH to digitize early modern manuscript material in the Clark’s collections.